Our motto gives a true picture of our Gallery. 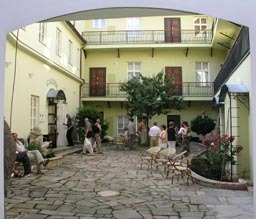 That is what you could expect when you enter our beautifuly renovated old Prague courtyard, where, on-site of former army stables you will find our shop. Or maybe we should better say the oassis in the very heart of the capital. 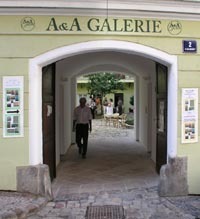 A&A GALERIE do not offer you just only paintings and other artists originals, photographs and other objects of art. We are also engaged in importing high quality English bone china and ceramics. Does not matters whether you are the tea enthusiast or prefer salads or baked dishes. You will find the right piece of tableware for any occasion here. We have for you everything from fragile tea cups to solid baking dish, freezer to oven safe. And we have to mentioned also the wide range of vases, flower pots, which bring the light to any interier. The products of PORTMEIRION, ROYAL WINTON and BURLEIGH are different in style, but all are well known for their flower patterns. For you, dear ladies we have the jewellery collections AURA BOREALIS, made of 100% hand made czech glass beads. You can either choose from ready made ones or you can have it made uniquely for you, So you can be sure that there is no other of same kind. Do not forget to visit us during your next Prague walk. We are looking forward to invite you in our oassis in the centre of Prague.